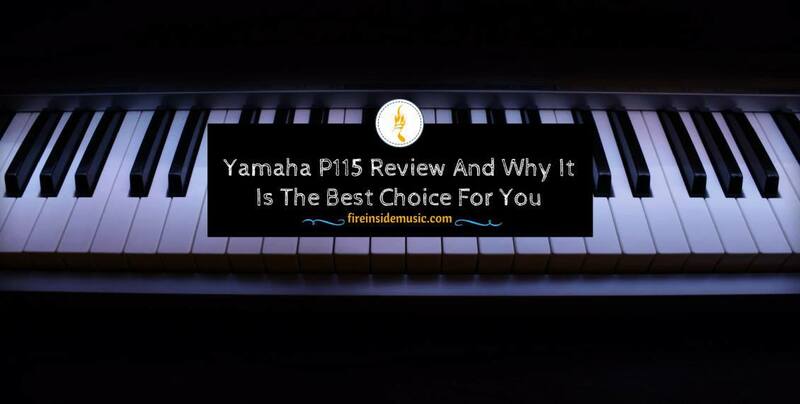 Yamaha P115 Review: Is It The Piano You Are Looking For? Everyone knows how hard to look for a digital piano in order to learn how to play piano. We believe that you always feel overwhelmed when seeing an endless number of keyboards on the market and don’t know how to pick up the best one, right? Well, if you’re a newbie or intermediate player, please read now a Yamaha P115 review since this instrument is truly the best choice for you. It’s because this portable digital piano doesn’t only have 88 keys with Graded Hammer Standard action but also get as close to the sound of an acoustic like playing a grand piano as possible. Even, it provides advanced players everything they want to make profound and beautiful music in both contemporary and classic styles. And now, let’s dive into a detailed review below so that you can understand the P115 from Yamaha better and clearer. If you prefer convenience, the Yamaha P115 is one of the few instruments that can be brought around by any professional players. Moreover, it comes with only the keyboard itself, a music stand for carrying the sheet music and some necessary accessories. Of course, setting up this digital piano is quite easy and straightforward. After putting the keyboard on a desk or a double X stand, you just attach the foot pedal and the music sheet. Or in case you want another foot pedal to control over your music, please consider the optional LP5A one. Whenever finishing everything, the remaining step is to tie the power cable and then the instrument is willing to create the music you want. Another great point that we notice the P155 is its material used in making the body of the unit, limiting cases of breakage remarkably. In the Yamaha P115 review, its sound features are known as the most important part. Indeed, this unit comes with lots of positive comments of excellent sound reproduction. There are 14 voices provided by the instrument including 3 Grand Pianos, 3 Electric Pianos, 3 Organs (jazz, pipe, and rock organ), strings, vibraphone, wood and electric bass, and harpsichord. Moreover, it’s equipped with Pure CF sound engine with the best sound of the marvelous Yamaha CFIIIS 9’ Concert Grand recorded at many volume levels for each note. Although the main focus is the piano tones, all sound pretty authentic, realistic and transparent. Especially, there is the reverberation sound effect that makes this unit’s sound more expressive and significant, inspiring the acoustic environment. The P115 has 88 weighted keys, which are the same size as on an acoustic piano. And it also means that these keys are heavy on the low end and then lighter in the high end. The Hard setting offers the broadest dynamic range from the softest pianissimo to the loudest fortissimo. Also, it permits you to play with great expressiveness. And remember to strike the keys hard to make the thunderous sound. On the other hand, the Fixed setting makes the keyboard not touch-sensitive. And at the same time, the piano will create the same amount of volume in spite of how soft or hard you play. The Medium setting is a default one, giving the most realistic and natural sound to a real piano. The Soft setting is often the last option. With two-speaker system of 7W + 7W amplifiers, the Yamaha P115 boasts of giving rich low-frequency and crisp, bright high tones. That’s why you are guaranteed to get a well-balanced sound. Although these speakers are only enough for home usage or performances in small halls, you can enhance its sound by connecting it to an amplifier or external speakers (make sure to shut off the speakers on the keyboard first). To replace P-105 and other keyboards with 128-key polyphony, Yamaha has improved the P115 with 192 keys. Relying on that, it offers a sound close to an acoustic piano. Thanks to the high polyphony count, you can get a big deep tone across all the keyboard voices. Also, this instrument brings a sounder damper resonance response, giving a more natural and elegant tone while playing. Through using a 2-track MIDI recorder, you are able to record your playing, store and then practice on internal memory. Interestingly, your recorded data can be adjusted after recording. In comparison with the Yamaha YPG 535 review, the Yamaha P115 is proud of 3 awesome modes including Split, Dual, and Duo. The Split mode separates your keyboard into 2 sections so that you can play a different sound in each part. The Dual mode permits you to layer 2 instrument sounds in such a way that they sound together across the whole range of the keyboard. For instance, you can layer strings sound on top of the piano sound to make a beautiful rich blend. Or you can layer any sound you want. The Duo mode lets you divide the keyboard into 2 parts, and each comes with an identical pitch range so that two players can sit and play at the same time. The Yamaha P115 boasts its music library with a complete list of 50 preset songs that are suitable for your playing or practicing demands. For example, a newbie might perform the left-hand session of a piece while the right-hand one is playing automatically. Especially, you are able to download MIDI-available user songs from the Internet through a USB as well. But, note that you only load one time. In case you have some recorded performance, make sure to transfer it to your computer before loading MIDI files, or you might lose all data. Then, although you can load the performance back onto the piano later, remember that it will replace the user song you’ve saved in the internal memory system. ​Transpose function permits you to alter the pitch of the whole keyboard in semitone steps. For instance, if you are playing a piano love song in F major, you also transpose the pitch and play that song in C major without learning it in a new key. Meanwhile, fine-tuning function helps to match the pitch of the piano to other instruments with 0.2Hz steps. However, notice that the Yamaha P115 don’t allow you to turn the standard “Equal Temperament” to other tuning systems such as Meantone, Pure Minor, Pure Major, and so on. Check now the 6.5mm headphone jacks on the front of this instrument that is famous for its convenience than the Yamaha P45. With 2 jacks, you and your friend can plug them and play at the same time without bothering anyone. As its name suggests, this port lets you connect your digital piano to smartphones, tablets, and computers. Make sure you buy an A to B USB cable before attaching it to anything. By connecting the piano to the computer, you can exchange MIDI files and use this unit as a MIDI controller with music apps like Mixcraft, GarageBand, FL Studio, and so on. Depending on the program, you also expand the capabilities of the piano in terms of music learning, recording, editing, etc. This jack is used to connect a sustain pedal that comes with the P115. But, you can use the sustain pedals with ¼ inch plug from other brands as well. Pedal jack permits you to attach the optional 3-pedal unit with Yamaha LP-5AWH/LP-5A plugs. Aux Out [R + L/L + R] can be used for an external speaker or amplifier to get the more powerful sound. According to the Yamaha P115 review, this piano offers a sustain pedal, making the sound pleasantly authentic and natural. But, if you need more pedaling control, you can buy an upgraded version or a triple pedal. Aside from essential features above, this Yamaha P115 review also shows some necessary functions that help you decide better. The onboard metronome will keep a proper rhythm and can be very helpful in improving basic skills like a sense of rhythm and time-keeping. Also, you are able to adjust the tempo, beat, and volume of the metronome. Especially, the P115 lets you change the metronome to one of the 14 inbuilt rhythms such as Jazz, Swing, Latin Pop, Disco, and so on. If you are looking to challenge yourself, this function will be the best choice. When practicing for a duet, especially when your partner is not present, this function offers the sound like you’re playing a duet, though you’re only alone. You just play the “left-hand” chords, and the auto-accompaniment will do the rest. And there are 10 different types like swing, blues, slow rock, boogie, etc. to choose. By using this function, the sound quality will become more transparent and balanced at low volume levels where low and high frequencies are not heard. Though, some reckon the Yamaha P115 sounds greats whether the IAC is on or off. If using this function, you can enhance the volume and make the sound softer, making soft-played notes clearly hearable. Additionally, it helps your instrument cut through a choir of instruments when performing. As its name suggests, the auto power off function helps to prevent unneeded power consumption by turning off the piano automatically after about 30 minutes of no use. Lightweight yet sturdy, making moving and carrying easy. Ideal for those any pianist, from beginners to advanced players. Offers excellent sound quality, somewhat close to the Yamaha grand piano. Boasts a dueling feature, allowing you to practice or play alone without having any partner. Provides a great iOS app for additional controls without having an LCD. Lack of the LCD, not preferred by some users. Your fingers might slip and get sweaty while playing since the keys don’t have the texture of synthetic ivory.. The price might be high for newbies. Indeed, the ES110 is a bit more expensive than the P115, though both are considered as one of the best digital pianos under $1000. The first noticeable thing is its 3-sensor Responsive Hammer Compact action, making it more authentic feel in comparison with the GHS action of the Yamaha. Besides, it comes with the Harmonic Imaging sound source with 19 instrument sounds (8 various piano tones) to choose. That’s why the ES110 from Kawaii is famous for its mellow and natural piano sound. Plus, it provides 192-note polyphony, 14W speakers, and only Split and Dual mode, not Duo one. Generally, this unit comes in handy and offers a lot of auditor depth while playing with the layering or split functions. It can be said that the Casio PX160 and Yamaha P115 has more similarities than differences. One of the most easily seen things is their similar weight and size. Also, they give full-weighted keyboards, providing an excellent play feel. Plus, both have enough 3 modes including Split, Dual, and Duo and some alike functions such as fine tuning, transposing, automatic power-off, and a 2-track MIDI recorder. But, the PX160 has 3-sensor action mechanism while the P115 has only 2. That’s why you will feel the Casio’s sound nicer and more realistic to the tough than the Yamaha. On the contrary, the P115 overcomes the PX160 in polyphony number (192 vs. 128) as well as Intelligent Acoustic Control, sound boost functions, and 10 accompaniment styles. All in all, both digital pianos avail high-quality multi-layered samples and come with decent speaker systems, which lead to a realistic and beautiful sound. The Roland FP30 is not only affordable for beginners but also offers a lot of great features for intermediate and even pro players. It provides 35 instrument sounds (more than the P115 with 14 ones). Moreover, it has a USB type-A port, Bluetooth MIDI, and powerful speakers with 22W. Although the FP30 has only 1-track MIDI recorder, it permits you to playback audio and MIDI files directly from a USB, making everything more convenient. Similar to the PX160, the FP30 includes 128-key polyphony. In case you prefer a great PHA-4 Standard keyboard with Ivory and Escapement feel and super-natural sound modeling tech, you should think about the FP30 from Roland. As a whole, the Yamaha P115 review is quite positive. From newbies to intermediate players, this digital piano will be a perfect decision. As for the keys, sound quality, action, and every single feature of this keyboard, it’s completed the Yamaha way, which is always to surpass. And at the price point, this product is an awesome deal since you can get a reasonable price together an excellent 3-year warranty. Be clear of the Yamaha P115 or still want to know more? Please send your questions in the comment section below so that we can discuss. Once again, thanks for your reading, guys!